Have you been looking for a way to track your trips and adventures in a visually compelling way? Do you get satisfaction from checking things off your list, or in this case, pinning them to a map? I’ve seen ads for these types of maps show up a lot lately in my Facebook and Instagram feeds (they clearly know their target audience), and I’ve been on the verge of buying one a few times. I was really excited when Conquest Maps reached out to collaborate*. What I love about Conquest Maps is not only are they an Ohio-based company, but they provide a slue of options to choose from, so it’s almost guaranteed you will be 100% happy with your map. You can literally make it exactly the way you want it to be. There are three styles to choose from: modern slate, rustic vintage or golden aged. You get the choice of a USA or world map and they have over 10 colors of pins you can use. Lastly, they allow you to personalize the map so you can make it truly unique. For my map, I chose a USA rustic vintage with a wanderlust quote as my customization, which you can see pictured above. It’s hung up in my dining room, making it a perfect conversation piece when we have guests over to the house. 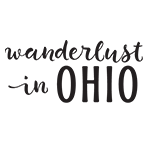 So, if you’re looking to add a fun, interactive piece to your house from an Ohio-based company get your own today! Some posts on this site contain affiliate links, meaning if you buy something through one of these links, I may earn a small commission (at no extra cost to you). *I was provided a free map from Conquest Maps, but all opinions in this post are my own. Mady this is so cool. After 7 years of world traveling I can tick a few of these lands off of my list, to show off a wee bit of conquesting. Digging it. Ryan you definitely need to invest in one with all your travels!! Love this! We bought something similar, albeit from a different brand, & need to start tracking our travels on it. Thanks!! They are so fun. There’s something so satisfying when we get to pin a new place! We have been meaning to get one of these maps. This is such an awesome way to track your adventures! Love this idea! Might have to hang one up in my house to inspire some more travel! I’ve been looking for a way to track all the places my kids and I have been. This looks like a great option. This is amazing! I definitely need one of these maps. My kids and I are always trying to keep track of our travels. This is perfect!